I have been an attorney for over 23 years with a concentration in the practice of Real Estate Law and Estate Law. In that time, I have dealt with many Real Estate Brokers, but none who are as experienced and knowledgeable as Jeff Grandis, Broker at Accord Real Estate Group, when it comes to real estate matters. Jeff Grandis is a highly talented and experienced broker. He is a master contract negotiator and he uses the latest technology and media services to represent your home or commercial property to as many potential buyers as possible. Jeff and his team specialize in representing property owners in the evaluation, marketing and sale of Estate properties. More importantly , Jeff is highly attentive, as if you were his only client. He listens to his clients and delivers on his promise to do his best to accommodate their needs. He returns all phone calls and emails the same day and you never feel neglected or unimportant. Jeff is highly personable with an energetic personality . 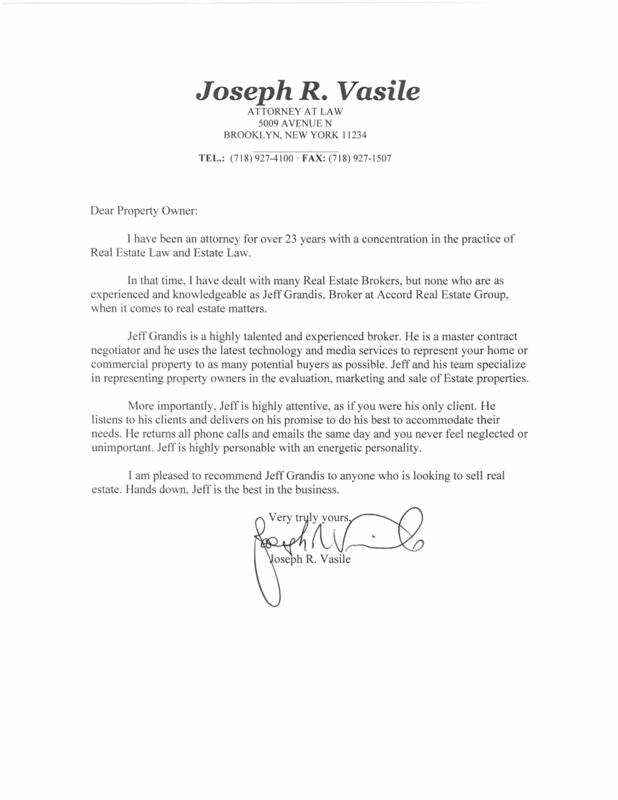 I am pleased to recommend Jeff Grand is to anyone who is looking to sell real estate. Hands down, Jeff is the best in the business.